Community health nurse Joseph Opoku Cobbinah is leading improvements in health care services for Ghanaian families. 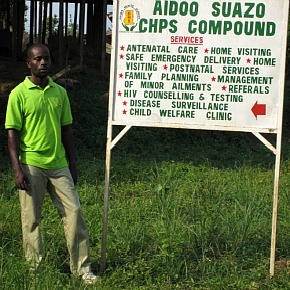 As a community health nurse (CHN) running a small clinic in Ellembelle District, Ghana, Joseph Opoku Cobbinah knew how to deliver basic health care to the people who came to the Aidoo Suazo Community-Based Health Planning and Services (CHPS) compound. But his clients were few and far from the clinic and Cobbinah was at a loss for how to change that. Then, thanks to the Jubilee Partners’ STAR CHPS (Supportive Technical Assistance for Revitalizing Community-Based Health Planning and Services) project, Cobbinah received the training and support he needed to connect with community leaders and health volunteers, reach more people in his district, and provide quality services. In a series of activities led by Jhpiego, Cobbinah learned new skills in various areas, including reproductive and child health, family planning, behavior change communication, community mobilization, infection prevention, HIV/AIDS and emergency deliveries. Community members were so pleased with the improved health services that they bought Cobbinah a motorbike to reach more people in the district. “I now have a proud place in this community and I am very happy to serve them,” he said. The STAR CHPS project is a unique public-private partnership of the Ghana Health Service, Jhpiego and the Jubilee Partners. The last of these is a collaboration of Tullow Oil Ghana, Kosmos Ghana, Ghana National Petroleum Corporation, Anadarko Petroleum Corporation and Petro SA. 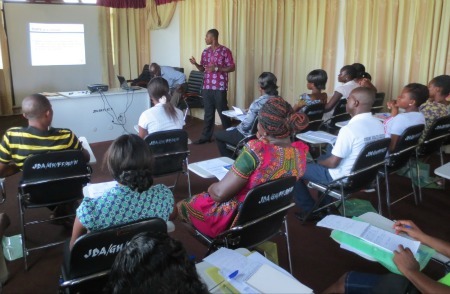 Now entering its third year, STAR CHPS is helping to build the capacity of health service providers in 61 facilities across six coastal districts of Ghana, strengthen health systems and engage communities in improving their health. A STAR CHPS follow-up review of Cobbinah’s delivery of health services found significant improvement in his clinic. He was given a 91 percent rating, up from 61 percent of standards met.The assessment team was so impressed by his enthusiasm, improvement of the facility and increase in utilization rates by community members that Jhpiego invited him to become a trainer of other CHNs. CHN Cobbinah trains other CHNs in best practices. The STAR CHPS project has recognized five other role models who are working with more than 130 CHNs across the six districts. The “stars,” such as CHN Cobbinah, are playing a leading role to ensure Ghanaians have quality health services.